I like meeting new roasters, especially those that are from more remote geographies and while North Berwick isn’t exactly the outer Hebrides, it is a fair distance from the metropolitan streets of Edinburgh. It’s out in these more remote locations that the real work of converting customers to specialty coffee and hand brewed filters is really done. Steampunk are no exception, offering a rotating selection of seasonal single origin beans that are well curated to all tastes and preferences. With three origins on offer, we took three samples to compare Steampunk’s range, starting from left to right and opening with their Nicaragua Aurora, an accessible typical coffee with chocolate and nut flavours, what you might call a foundation coffee. The second was their Colombia Angel, a slightly fruitier and sweeter washed coffee offering more of interest and well designed for filter, a discovery coffee if you will. Finally their Ethiopia Kayon Mountain a soft and creamy display of fruity blueberries, ideal for turning milk into blueberry milkshakes and vibrant as a filter. A coffee for all those making the transition to specialty, for those who take comfortable baby steps and for those leaping headfirst into a bowl of fruit. Feeling a little peckish and taking advantage of the in festival seating, a set of leather sofas dropped in between stands, we headed over to the guys at Cakesmiths to pick up a selection of their cakes. 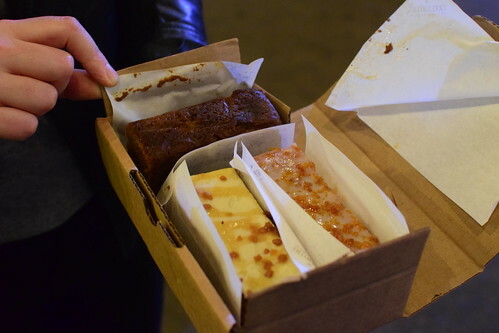 If a cake has to be worth the calories, or some other similar expression, I’m glad Cakesmiths’s are the coffee festival cake provider of choice, because we spend little time hesitating over whether or not to order any. Picking some classic pear and ginger loaf to go with some honey&bergamot and sticky toffee cake, which we leisurely enjoyed before making are way over to Raw Materials 2pm cupping at the Hundred House stand. 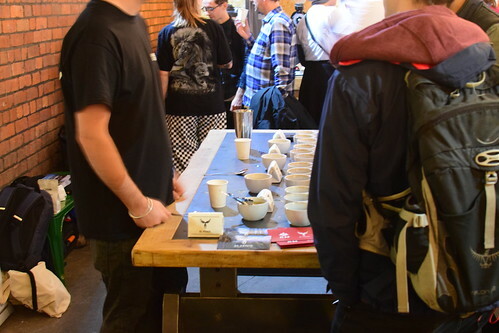 After showcasing the El Fenix lots earlier in the day, Raw Materials 2pm cupping was designed to showcase their Wush Wush imports. Much like geisha, Wush Wush is a varietal from Ethiopia, the Keffa region to be precise, known for its quality flavour profile, which is now also grown in Colombia. 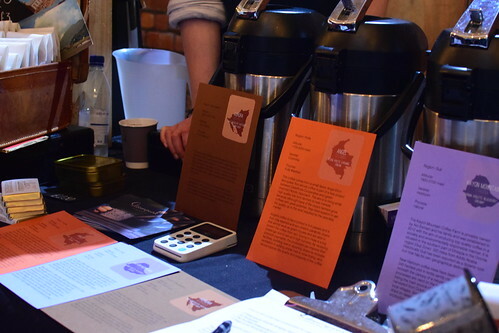 It’s a coffee I’ve tried before at London Coffee Festival with Raw Materials previous cupping, where I remembered a preference for the natural Myanmar and the washed Wush Wush. This time round I was quite heavily drawn to the honey processed Wush Wush in the cup with its distinctive aroma, there was a lot of the word funk thrown around at the cupping, so much so that the honey process got nickname George Clinton & Parliament, while the natural – which was in all fairness slightly funkier – received the moniker James Brown. 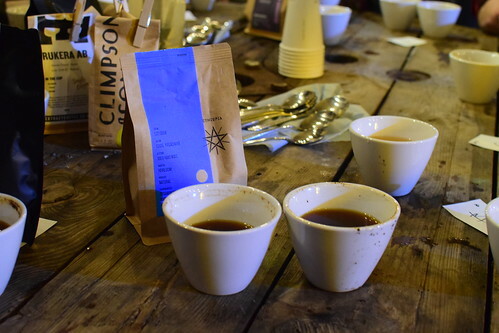 Those funky aromas translated well to flavour and again I found myself drawn to the honey processed lot, which seemed to offer more complexity and balance that the other cups on the table, though there was very little consensus on picking a favourite. Either way Wush Wush, much like geisha seems pretty versatile at showing clarity through all types of processing and I wouldn’t be surprised to see it around more and more as new lots yield harvests in Raw Materials Colombian projects. Already stood at the Hundred House stand Matt Wade caught our eye and so we swung around the cupping table to speak to another new roaster. Seemingly as happy to talk about growing up in Kent, travelling round the world and his new life in Shropshire – it’s that middle of nowhere bit, west of Birmingham and east of Wales – it was a good while before we got onto the topic of coffee or remembered to try any. While Hundred House are a new roaster, Matt’s been roasting for over 15 years and has been a Q grader almost as long, roasting for the likes of Union and Matthew Algie and that length of time in coffee clearly comes with some stories. Matt passed us some samples of Nitro he had on his stand, of which I remember very little as he took us on the adventures of a wandering coffee roaster. Talking about his time in Dubai roasting specialty coffee for an emerging and burgeoning market – one where most families do home roasting – he was tasked with finding and supplying Mexican Pacamara to some prestigious families. Like an episode from Todd Carmichael’s Dangerous Grounds they flew out to Mexico in search of this illustrious Mexican Pacamara in the hope of finding enough to fulfil orders. After asking around here and there and making deals on the fly, they eventually returned home with 8 tonnes of the stuff. Matt was full of stories, too many to mention here, although if you’re interested you can read some of his witty musings here. What about the coffee I hear you cry! Well you can read about that below at the ‘In The Hopper’ cupping. It was here where we bumped into to Scott from Caffeine Magazine, you can see him on the left photobombing my above shot of the Colonna Coffee crew eating cake. I’ve been a fan of Caffeine Magazine for a while now, ever since I picked up my first copy from Browns (now Water Lane Coffeehouse) in Canterbury – Issue 8 I’m reliably informed – and so it was nice to meet the man responsible for all those attractive front covers. 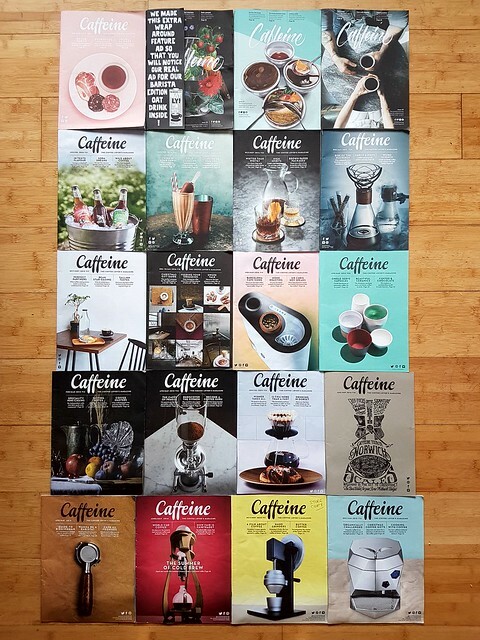 Attractive covers that take a lot longer to create than you might think, even Caffeine Mag’s Instagram takes some curating to produce those easy on the eye coffee images. We chatted about coffee media, when it’s best to roast green coffee and expensive coffee lots and their real value, but we also got some insights into Scott’s life as he joked about having to order soy mocha lattes for friends while trying to remain anonymous and about the disconcerting, but flattering reports of certain cafes stealing Caffeine Mags from other better stocked ones, such was the demand for the magazine. Reminding us that he was running the ‘In the Hopper’ cupping that afternoon, we told him we’d be there. 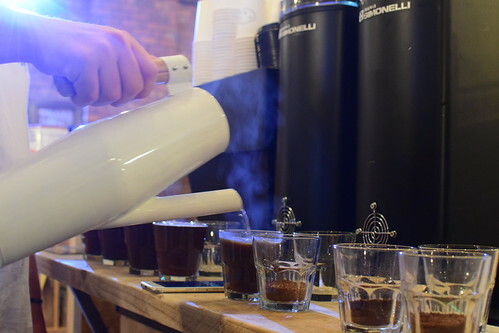 Running a little behind time, as cuppings do at coffee festivals, we had chance to catch up with Brian Williams and his recent travellings all over the place. You can read about his Cup North experience here and about all his other travels here. Admitting that he’d spent about 2 days at home in the last month, he’d been a busy man flying back in from Chicago to Manchester a day before the festival without having been home to attend Cup North. 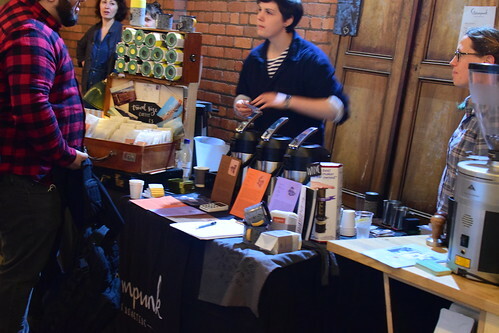 It’s always nice to see Brian and I’ve often proclaimed him the ‘nicest man in coffee’, but if you do see a man with a beard and a waistcoat furiously taking notes at a coffee festival be sure to approach him for a chat. 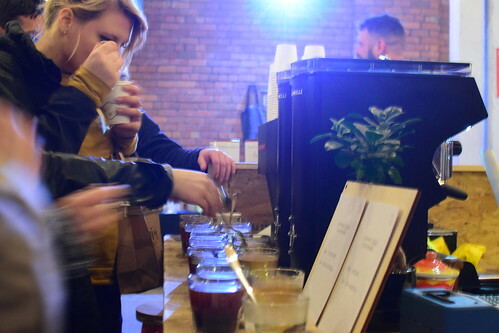 With the cups all poured it was time to see what roasters all across the country had to offer for the ‘In the Hopper’ cupping and what some notorious coffee people thought of them. 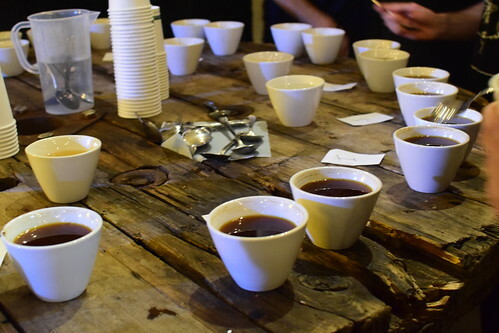 Tasting my way round the table from H to F, as you do, there was interesting coffees on the way round and it was enjoyable to compare them all blind, forgetting all preferences and judgements in the wake of unadulterated flavour. I found my favourite end of the table around A, enjoying D, P and O also. I had it down to four coffees, but as you only get 3 preference votes I was going to have to narrow it down further. 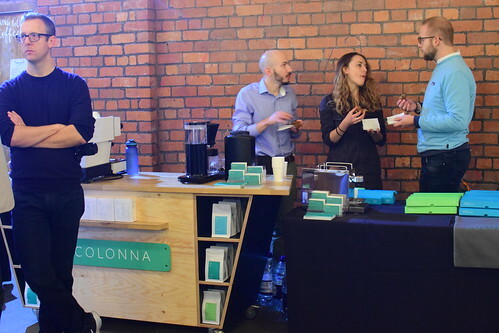 A, was unmistakeably my favourite, it was the coffee I would be keeping an eye on, but funnily enough Matt Wade couldn’t understand why anyone would like it. 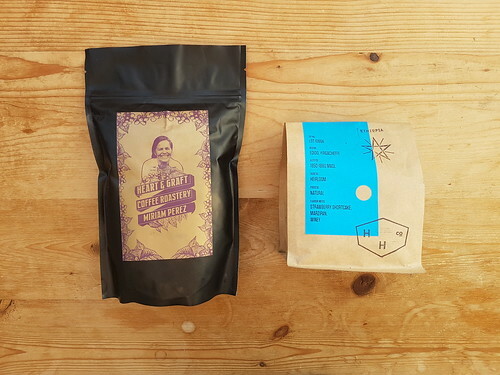 Having cast our votes and picked our favourites, it was time for the big reveal and as it turned out my favourite coffee on the table was Hundred House’s Ethiopian Edido Yirgacheffe, those unmistakeable big strawberry notes had me sold at first taste. For the winner you’ll have to pick up the next issue of Caffeiene Mag to see who’s coffee came out on top, but in the meantime should you want to purchase my favourite you can pick some up here. While Matt, might not have enjoyed his own coffee I certainly did and So I made my way back over to their stand to see Annabelle and pick up a bag to take home with me. Followed close behind by Brian Williams who’d particularly enjoyed their Kenyan, which is available in short supply here. 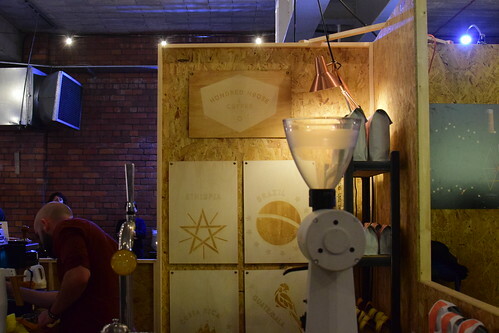 This entry was posted in coffee, Coffee Roasting, Coffee Tasting, Cup North, Espresso, Uncategorized and tagged Caffeine Magazine, Cup North, cupping, Hundred House, In the Hopper, Manchester Coffee Festival, Raw Materials, Steampunk Coffee, Wush Wush by commoditiesconnoisseur. Bookmark the permalink.